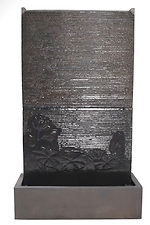 The Frangipani Water Wall-Fountain is one of Satu Bumi’s range of GRC Water Features. At nearly two meters tall, the Frangipani Water Wall Fountain is a very solid and impressive water feature specifically designed to place against a wall. It has a predominately ripple textured face with a frangipani design towards the bottom. The water cascades from the top of the fountain and provides a feeling of calmness. It is available in a number of different old metallic and old stone colours that provide a traditional and appealing aged appearance and painted enamel that looks great in inside spaces.